Established in Wiltshire in 1992, Royale Casino Entertainments today has offices all over the country. 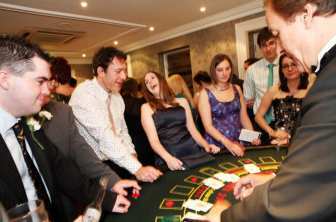 What is unique about this company is that it brings the glamour, fun and excitement of a casino experience to your venue, complete with an Event Manager, gaming tables and croupiers. If you are hosting a special event, be it for friends or your colleagues, you can treat them to something really different. Royale Casino will bring a live casino to your event and offer games such as American Roulette, French Roulette, Blackjack, Pontoon, Poker, American Dice, Baccarat, Chemin-de-Far. The friendly and professionally attired croupiers will take time out to teach and explain the rules of each game. Complimentary 'how to play' leaflets will also be handed over. While your guests won’t be playing for real money, they will be competing for set prizes at the end of the evening. The advantage of playing for ‘fun’ money is that your guests can play for as long as they like without being concerned about any losses. The 'fun', money is professionally printed and can include your company name, logo, a personalised photograph, date of the occasion and more, all in high quality graphics making it a perfect souvenir of the event. Royale Casino Entertainment takes care of the entire event for you. All you have to do is call up the office nearest to you with your requirement. The company is the ideal entertainment option fro corporate events, weddings, private functions, charity events, parties and more. You don’t have to worry about a thing, everything is managed for you right from setting up, provision of all equipment and professional staff, assistance for your guests, allocation of prizes and clearing up at the end of the evening. The Royale Casino package includes your very own Event Manager, first class professional tables, one professional croupier per table and a cashier to distribute 'fun' money to guests as well as work out and present the prizes. You will also receive personalised 'fun' money, gaming chips as well as 'How to Play' instructions, a full 3 hour gaming session and more. Make your event a memorable one with Royale Casino Entertainment today!